Do you listen to music while you surfing online? Sometimes I do, but not easy if you want listen to different music sites or check singers and lyrics. 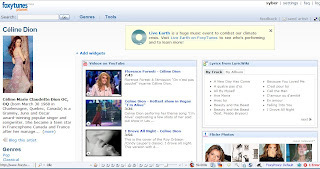 FoxyTunes offers a webtool that lets you control almost any media player and find lyrics, covers, videos, bios and much more with a click right from your browser. It has two kind of add-on extension for IE and Firefox browsers. After you added it on your browser, a mini player appears on the bottom of screen. You can use it to search (regular search not special for music) or play music online (I don't know how, it always pop up other players such as Windows Media Player or Realplayer) or in your hard drive, you do not worry about if it bother you. FoxyTunes also has another feature, that called Signatunes and allows you adds a small icon to your favorite webmail and blogging services while you composing (but I don't know what it for). I could not use mini player to play any music with its widgets which mush up many music sites, it always pop up player which from other music site. I think maybe something it need improve,and its FAQ is not useful.